Members of the Olentangy Liberty boys basketball team hold up their championship trophy after beating Pickerington North 64-58 in Saturday’s Division I regional final at Ohio Dominican. 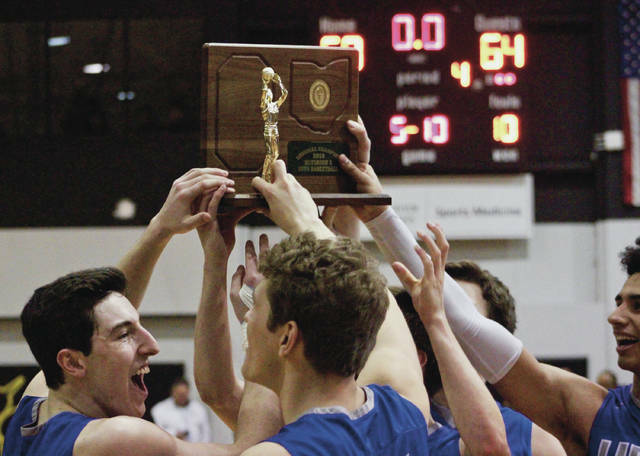 COLUMBUS – Saturday afternoon’s (March 16) Division I regional championship epitomized everything the Olentangy Liberty boys basketball team has done all season long. As a result, the Patriots are headed to the state final four for the first time in school history with a 64-58 win over Pickerington North. Liberty is the first from the Olentangy School District to make it to the final four and the first to make it from Delaware County since Westerville North did it in 1996. How did the Patriots prepare for this historical game? Ben Roderick, as he has done so many times this season, led the Patriots in scoring with 20 points and got solid backing from Nick Nakasian, who added 15. Nakasian knocked down a 3-pointer on Liberty’s first possession of the second half and the Patriots (24-4) never trailed again. Henry Hinkle provided a spark off the bench with 14 points, including eight in the fourth quarter to help the Patriots put the game away. He even got his moment of redemption by knocking down all four of his free-throw attempts in the final minute to help Liberty seal the win after missing a pair of free throws with 0.8 seconds left in regulation against Pickerington Central Thursday night. Mitchell Kershner added eight points and did all of the little things that he has done to help the Patriots win this season. He led with eight rebounds, six assists and added a couple of blocks and a pair of steals. Roderick finished with five rebounds and a pair of steals, Nakasian had four assists and Jack Metzger added four points and four rebounds off the bench. Hinkle sparked Liberty off the bench as it battled back from an 8-0 hole to start. He assisted on a pair of baskets late in the opening quarter to help the Patriots whittle their deficit to three. But Jack Sawyer buried a 3-pointer in the final seconds to give the Panthers a 17-11 lead at the end one. Kershner drove the baseline and kicked to Kal Jayaraman for an open 3 in the left corner to open the second and then hit one of his own off a Hinkle assist to tie the game 17-17 with 6:45 left in the half. Roderick buried a pair of free throws on the next possession to give Liberty its first lead. Sawyer scored six points and Chris Scott had four in a 10-2 Panther run late in the half before Roderick buried a jumper in the final seconds to cut Liberty’s deficit to 27-25 at the break. Nakasian buried the go-ahead 3-pointer on the left wing off a Kershner feed with 7:46 remaining in the third. Roderick drove the lane and flipped in a shot with his left hand, drawing a foul and converting the ensuing free throw to give Liberty the lead for good with 5:58 left in the third after a Sawyer 3-pointer had tied it on the previous possession. Sawyer scored just one point the rest of the way. Nakasian scored three straight baskets and Roderick bookended it with a pair in a 10-1 run in the fourth quarter that gave the Patriots their biggest lead at 57-46 with 3:33 remaining. Scott had a game-high 23 points and added three assists and Sawyer added 18 points, including 13 in first half to lead the Panthers (23-5). Hunter Shedenhelm had five rebounds, three steals and a pair of assists and Sawyer had four rebounds for North, which had won 11 straight since losing to Liberty Jan. 26. Liberty advances to the state semifinal where it will meet Akron St. Vincent-St. Mary Friday night (March 22) at 8 p.m. at Ohio State’s Jerome Schottenstein Center.